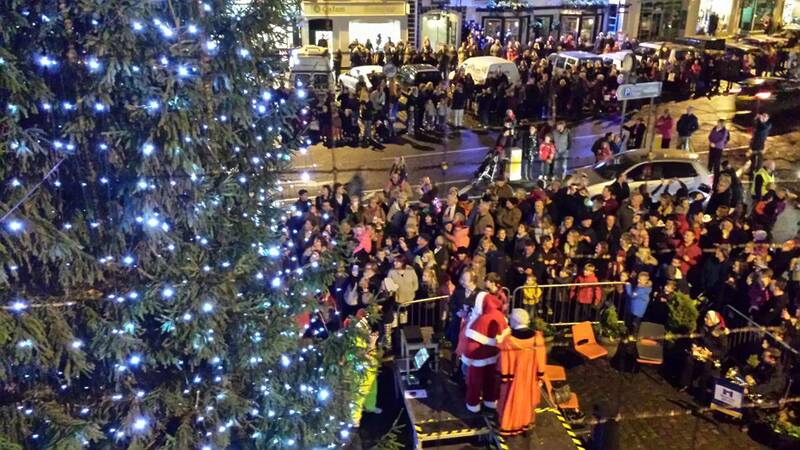 Over 2000 people attended the switching on of the Christmas lights in Skipton on 27th November. 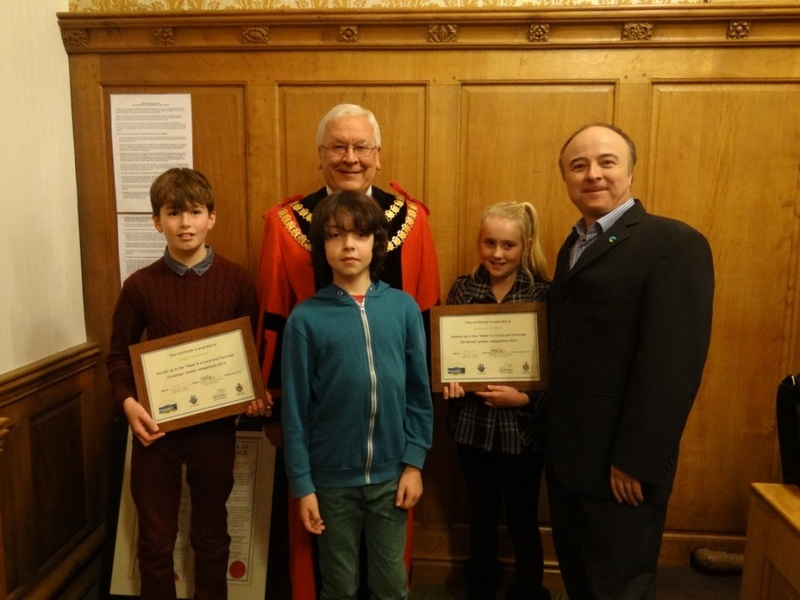 This year the theme for the switch on was ‘make it a local and Fairtrade Christmas’ and the honour of illuminating the town went to Kaden of Water Street Primary School, who designed the poster for the event, and to Mark Dawson, the Coordinator of Fairtrade Yorkshire. 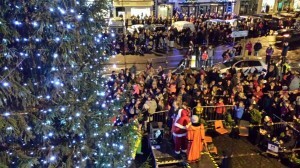 The crowds were treated to an exciting entertainment line up including a rousing brassband and an appearance from Santa. Late night shopping gave the people of Skipton the chance to marvel at the lights and purchase Fair Trade food, beverages and gifts from the many outlets in the town that sell them, including the dedicated Fair Trade shop, From the Source. Skipton celebrated its first Christmas as a Fairtrade Town and following the switching on there was a civic reception in the Town Hall, hosted by the Mayor of Skipton, Councillor John Dawson. Kaden was congratulated alongside runners up in the poster competition: Gemma of Greatwood Primary School and Jack from Parish Church Primary School. This year’s spectacular Christmas light ‘switch on’ in Skipton, on Thursday 27th November, will have an extra special Fairtrade flavour. The slogan for the town centre switch on will be ‘make it a local and Fairtrade Christmas.’ Shoppers are encouraged to support the wide variety of local shops and businesses in Skipton, not least the thriving market. Skipton, which has recently been declared a Fairtrade Town, has many businesses which sell or serve Fairtrade products, and it is the home of the dedicated Fair Trade shop ‘From the Source’ which sells a selection of high quality hand made gifts and fashion items. On the 27th, live entertainment will take place from 5pm to 8pm, just outside of the Town Hall. A brassband will play from 5.30, leading up to the grand illumination at 6pm. The lights will be switched on by the Coordinator of Fairtrade Yorkshire, Mark Dawson, and the winner of the local and Fairtrade poster competition, Kaden, from Water Street Primary School. 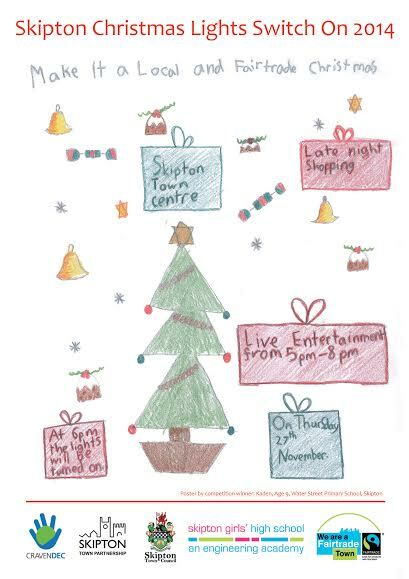 Over 200 entries were received in the competition to design a poster for the switch on and Kaden’s winning entry was chosen by a panel which included the Town Centre Manager and the Coordinator of Fairtrade Skipton. Many of Skipton’s businesses will be open for the evening. So come along and enjoy the magical atmosphere in the countdown to a Fairtrade Christmas. The Malton and Norton Fairtrade Group hosted their annual Christmas shop at the Friends Meeting House, in Malton on Saturday 8th November. The group sold a wide variety of fair trade gifts, food, crafts, decorations and cards. The Malton shopper was introduced to an incredible range of quality ethical products, ensuring a win-win outcome for both shopper and producer. Despite atrocious weather, over £1600 of goods were sold. Children at Kirkstall St.Stephens Primary School were the first School Council to trial the “Peer Educators toolkit” on Fairtrade, developed by Leeds Development Education Centre (DEC). The toolkit is designed so children are taught the activities first with their School Council teacher, then go on to become Peer Educators, teaching the activities to the rest of the school. 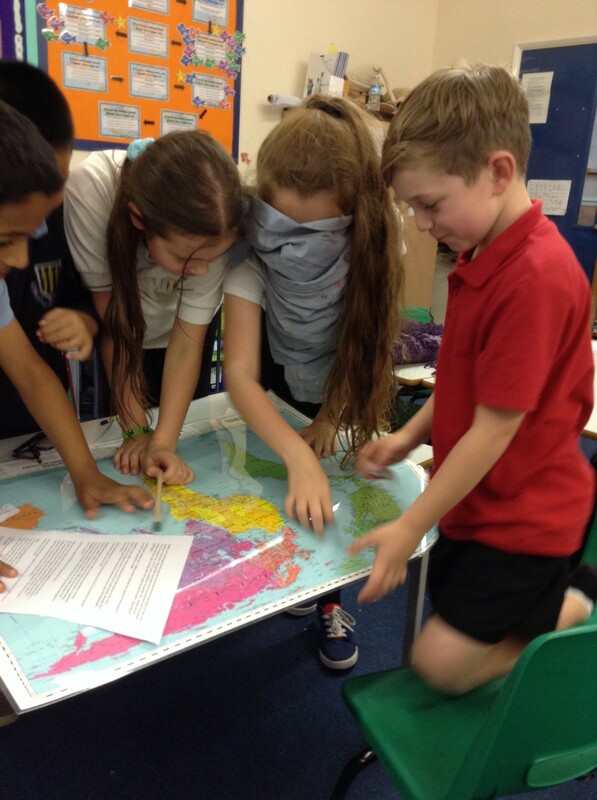 The toolkits are part of the EC funded ‘Global Fairness: Schools as Agents of Change’ project which empowers children to learn about injustice and take action to make the world a fairer place. Three toolkits have been developed on the themes of Fairtrade, Garment Workers and Waste. Feedback from the children showed the pupils’ enjoyment and learning, with responses such as “I felt happy and thankful for the farmers” and “I have learnt that fair trade is a really big difference to people’s lives”. 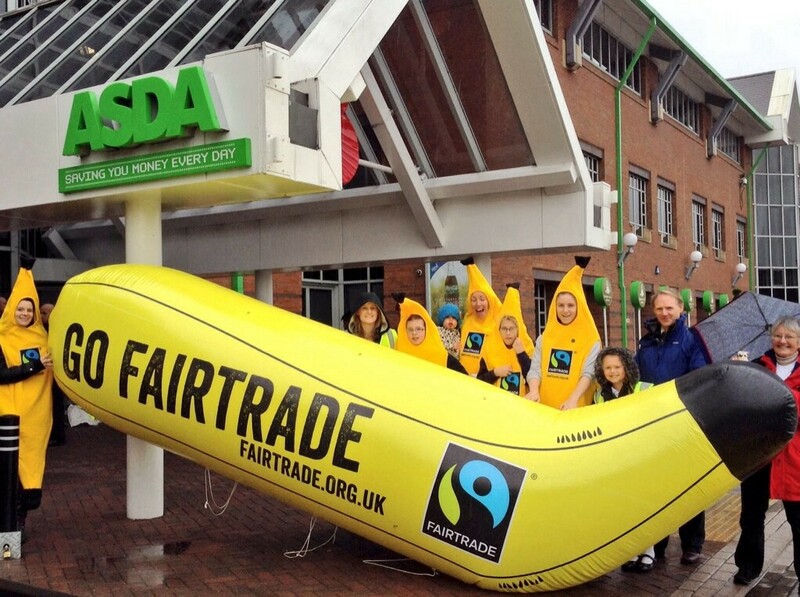 Schools are still being invited to trial the toolkits of Fairtrade, Waste and Garment workers, until Christmas. If your school is interested in a free Fairtrade workshop, please contact Hannah@leedsdec.org.uk.